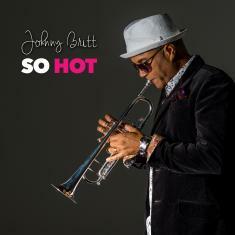 LOS ANGELES (4 April 2019): As spring revelers take flight so does trumpeter Johnny Britt's "Highway 10," the new single from his "So Hot" album. The energizing excursion of soul-jazz penned and produced by Britt scored most added status in its first week at radio, according to the Billboard chart for the week of April 6. Britt plays a bevy of instruments on "Highway 10," including flugelhorn, trumpet, keyboards, Moog, strings, bass and programming. Drummer Marcus Williams and percussionist Sean Lawson help drive the funky rhythms, and guitarist Nils and tenor saxophonist Bobby English add a vibrant bouquet of harmonies. "I wrote ‘Highway 10' as a feel good, groovy track. I wanted something hip with a funky feel to it. I always like to express my horn like the way I sing as a vocalist - with feeling and soul," said Britt about the second single from his J-Jams album release. To celebrate the single release, Britt has a busy concert calendar this month. First, he steps into the Hollywood spotlight at Catalina Jazz Club next Wednesday (April 10). Two days later, he plays Brookside at the Rose Bowl in Pasadena. On April 21, Britt will be in Detroit to perform at the International Institute. He'll close Jazz Appreciation Month by playing tribute to jazz legend Donald Byrd on April 28 at The Miracle Theater in Inglewood. Last fall, Britt issued the title track of "So Hot" as a radio single. The cut featuring two-time Grammy winner Paul Brown on guitar also registered most added status at Billboard when it debuted. The album is the trumpeter-singer's first smooth/contemporary jazz outing, offering eight instrumentals and four vocal tunes. The disc features eleven Britt originals along with a sensual revision of Minnie Riperton's lovestruck "Loving You" sung by the horn man. Along for the session is seminal urban-jazz saxophonist Najee who dials up the heat on "Hot Fun In The Summer," a song that promises to be a summer single. Britt utilizes the album to introduce his 20-year-old son, Josh Britt, who plays acoustic guitar on "Loving You" and muted trumpet opposite his father's flugelhorn on the song inspired by his birth, "Heaven Sent." Early on, Britt immersed himself deeply into jazz, meeting the artform's icons and legends and studying diligently to become a classically-trained jazz trumpet player at The Versailles Conservatory near Paris, France. He is no stranger to the smooth/contemporary side of jazz having composed material for some of the genre's stars, including three No. 1 hits for Boney James and songs for Rick Braun, Euge Groove and Brown. The tunesmith also wrote for R&B singer Peabo Bryson and Motown legends The Temptations, the latter for whom he served as musical director. He was co-music producer for the Emmy-winning miniseries "The Temptations." Britt landed a record deal with Motown's MoJazz label for a forward-thinking project he created called Impromp2 that blended hip hop, soul and jazz, releasing four albums. Britt debuted as a solo artist with the 2010 worship album, "There Is Nobody." Two years later, he dropped the secular "Feels So Good." Britt cites his greatest trumpet influence as Miles Davis and patterns his vocal delivery after Marvin Gaye, leading to the critically-hailed 2016 release "Marvin Meets Miles." Either as a trumpeter and/or a vocalist, Britt has collaborated with Quincy Jones, David Bowie, Annie Lennox, Josh Groban, Jennifer Lopez and Maxwell. He played a trumpet solo on screen in "La La Land" in a scene with Ryan Gosling and was the trumpet soloist on Hans Zimmer's soundtrack to "Hidden Figures." Britt sang on the Academy Awards telecast with John Legend, Common and Mary J. Blige. For more information, please visit https://johnnybritt.com.